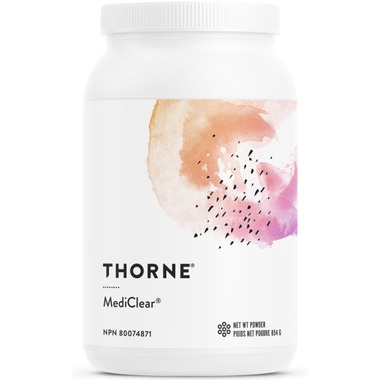 Thorne Research MediClear Protein Powder provides essential nutrient cofactors, while supplying an adequate amount of low-allergenicity protein and can be very beneficial to liver function. Many challenges to health can arise when a patient’s liver is not functioning as it should, including poor digestion, imbalances in intestinal bacteria, and fatigue. MediClear includes beneficial detoxification nutrient cofactors, as well as an array of extra nutrients and botanicals in powder form that can be added to water, fruit juice, or nut milk. Other Ingredients: Pure Cane Molasses, Silicon Dioxide, Monk Fruit concentrate (fruit) (Siraitia grosvenorii)†††††††, and Vanilla and Orange Flavoring. Contains ingredients derived from soy (phytosomes). Suggested Use: For adults and children 12 or more years of age. Mix one serving (two scoops) with at least 8 ounces of cold water, juice, rice milk, or nut milk, or as recommended by your health-care practitioner. This product is not a medical food. It is intended to be utilized in conjunction with a complete dietary program. Do not use in diets supplying less than 600 calories per day without complete medical supervision. Risk Information: Do not use if you are pregnant or breastfeeding. Consult a health-care practitioner prior to use if you have cystinuria, or if you are taking antibiotics or nitroglycerin. Consult a health-care practitioner prior to use if you have cardiovascular disease, an iron deficiency, if you are following a low protein diet or if you have a liver disorder or develop symptoms of liver trouble (such as abdominal pain, dark urine or jaundice). Zinc supplementation can cause a copper deficiency. Some people may experience mild gastrointestinal bloating, constipation or indigestion.